You must have taken a screenshot at least once on your iOS device. If you’re a new iOS device owner or you’ve got no idea how to take screenshots, by pressing the home button and power button together at the same time, a screenshot of the current page of your device will be taken and saved to your camera roll. A new jailbreak tweak has been released in Cydia recently that provides users more control over the screenshot taken by giving you more features. Called ClipShot, this tweak allows you to save the screenshot taken to your camera roll, to copy it to your clipboard so that you can paste it elsewhere or to save it both to camera roll and clipboard. When you save the screenshots to clipboard, you can easily paste it into another app without having to input it from the photos app. When you install ClipShot, you’ll be provided with a range of configurations to make via the Settings app. You can set the default action to “Ask” where a pop-up appears when you take a screenshot asking whether you want to save it to the camera roll or clipboard. 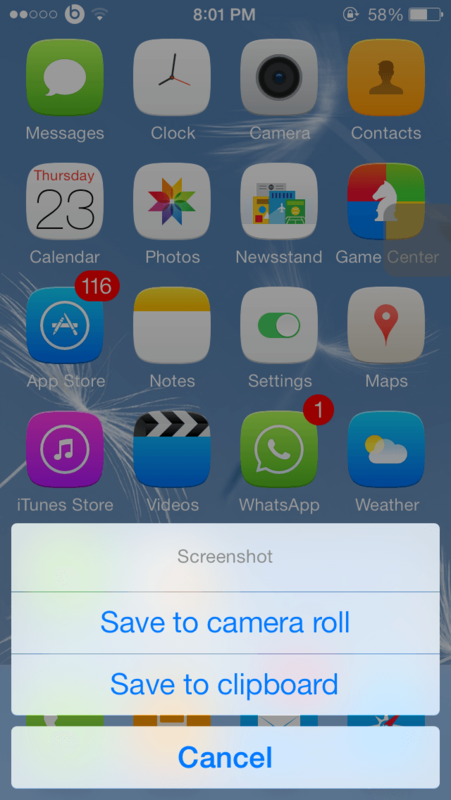 You can also set the default action to “Save to camera roll” or “Save to clipboard” . Then you’ll have the “Always copy to clipboard” option where the screenshots will be saved both to the camera roll and to the clipboard. In addition, you can enable/disable the camera to flash when screenshot is taken, enable/disable a shutter sound to play when screenshot is taken and choose whether you want to notify the open app that a screenshot was taken. If you don’t want your camera roll cluttered up with screenshots or want to quickly paste a screenshot to another app then you must try ClipShot. ClipShot is available in Cydia for free and works on all devices running iOS 7.